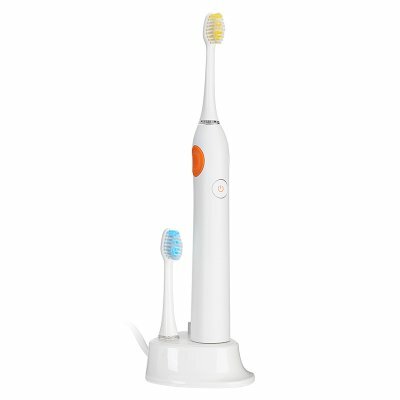 Successfully Added BLYL Electric Sonic Toothbrush - Two-Minute Timer, 31,000 to 48,000 Strokes Per Minute, 5 Modes, DuPont Bristles (White) to your Shopping Cart. Give your teeth the professional cleaning treatment with the BLYL Sonic toothbrush. This dental cleaning aid is proven to reduce plaque build-up and clean your teeth better than a manual toothbrush. It has all the features you really need at an affordable price and a rechargeable built-in battery that lasts up to 6 weeks with regular usage. To ensure your teeth get are cleaned thoroughly dentists recommend brushing for two minutes. With its auto timer, this electric toothbrush ensures you'll give your pearly whites the attention they deserve and in return, your glistening smile will be sure to get you noticed. With 5 different modes (clean, whiten, polish, massage, gentle ) and speeds from 3100 to 48000 sonic strokes every minute the BLYL electric toothbrush is the easy and effective way to clean your teeth. The soft brush head has precision bristles from leading pioneers of synthetic filament, DuPont. This ensures they have a long life and effectively clean without damaging your gums, ideal for those with sensitive gums and teeth. This electric toothbrush can be of particular help if you suffer from arthritis or have limited mobility as the power toothbrush makes the brushing actions for you so your teeth get a proper clean without any exertion on your part. If you have a tendency to over brushing with a hard manual brush then this toothbrush can be a blessing for your gums and teeth. The BLYL Sonic toothbrush comes with 12 months warranty, brought to you by the leader in electronic devices as well as wholesale health gadgets..